The initial consultation involves a thorough dental exam and evaluation of the patient’s dental health and personal needs. 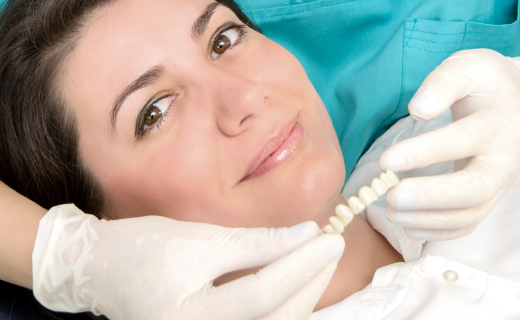 The procedure of applying veneers includes several steps and may require more than one visit. First, the tooth is prepared. A temporary veneer is fitted while a dental laboratory creates a permanent porcelain veneer that matches the patient’s natural tooth color. During the final visit, the temporary veneer is removed, and the permanent one is bonded to the tooth’s surface. With good oral hygiene and regular dental care from an affordable dentist, porcelain dental veneers can provide gorgeous smiles for decades. Routine check-ups can ensure that minor problems such as nighttime tooth-grinding or problems with adjacent teeth are discovered and treated promptly. To learn how veneers can transform your smile, make a dental appointment today to discuss your options.